A recent Chromium build extended the synchronization feature to settings and autofill data. 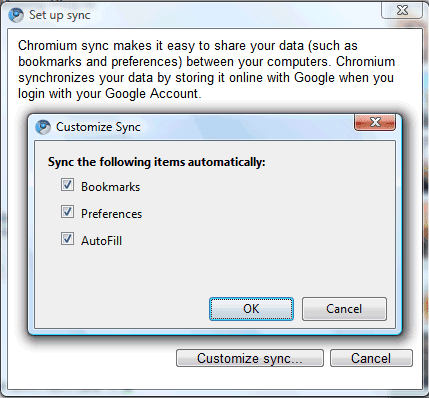 When you setup Chrome sync, you have to option to only synchronize bookmarks, settings or autofill data. Google stores your data online and links it to a Google account. For some reason, Chrome settings and autofill data are saved in Google Docs, but the two files can't be shared or exported. The nice thing about Chrome Sync and other similar services (Opera Link, Mozilla Weave, Google Toolbar) is that you can use any computer and keep your browser's data in sync. Mozilla Weave synchronizes more data: passwords, sessions, browser history, but it's likely that Google will add these features to Chrome. Google could also synchronize extensions and themes. Themes sync is on the way, too, already. Almost completely implemented. I believe it will be in Chrome 5. Would be great if I could choose which bookmark (or whole folder) exclude from sync on local machine. Keep up good work Google! How can We get this?????????????? This is a wonderful idea! I like it and the idea of syncing data (photos,settings, files, etc) with an online image I can create and manage. Finer grained controls on what syncs (eg: I might want to exclude my banking site) would be much appreciated. They stole Opera feature BASTARDS. This is a great feature, but Autofill is greyed out for me. I wonder what security measures, encryption and otherwise, Google will employ to keep the Autofill data safe. Autofill used to be available in Chromium and it will probably be back in a future release. They need to synchronize the custom dictionary. I have hundreds of specialized terms I use all the time, and I want to make sure they follow me around. I don't want Chrome to remember ANY Autofill data. How do I turn it off? there is no option to do this in the Options menues. Do I have to go back to using Firefox? Yes, there is an option to disable autofill and another option to disable synchronizing autofill data. Options > Personal Stuff > Autofill options > uncheck "Enable autofill"